Figure 1. Location of the hyoid. The hyoid is a small, U-shaped bone situated centrally in the upper part of the neck, beneath the mandible but above the larynx near the level of the third cervical vertebra. It can be felt by pressing one's finger into the crease where the chin becomes the neck. 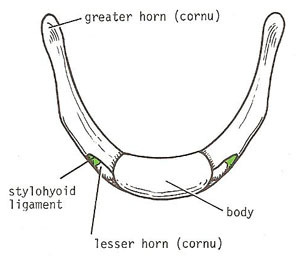 The hyoid bone consists of three separate parts – the body, and the left and right greater and lesser cornu (horns) – which fuse in early adulthood. The function of the hyoid is to provide an anchor point for the muscles of the tongue and for those in the upper part of the front of the neck. 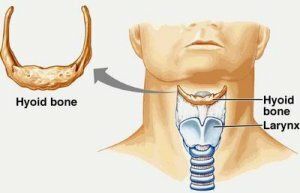 The hyoid is (uniquely in the vertebrate skeleton) not joined to any other bone but is suspended in position by muscles that connect it to the mandible, to the styloid process of each temporal bone at the base of the skull, to the thyroid cartilage, to the sternum, and to the scapula. 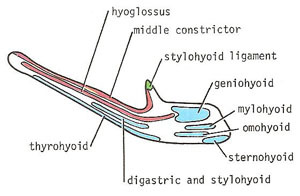 The important muscles that are attached to the hyoid bone are shown in the lower two diagrams.